The HCR1100-ER drill incorporates innovative features for higher output and is capable of drilling at larger diameters. Utilizing a Cummins® Tier-IV EPA compliant engine, the HCR1100-ER combines higher performance with fuel efficiency. The Furukawa HD822 drifter (patent applied for) is designed to minimize drill noise and vibration, while increasing performance. 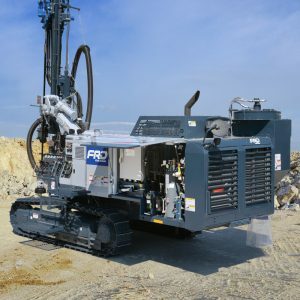 With 26.7% more impact and 13% more airflow than its predecessor, this drill has the ability to perform in harder rock at a larger diameter. Automatic rod changer to eliminate the need for operators to manually install drill steel, resulting in increased production and enhanced operator safety. Operating Weight with Fuel/Oil 27,500 lbs. 12,460 kg. Operating Weight 533 lbs. 242 kg.